Hephaestus was the son of Zeus and Hera and was the Ancient Greek God of Blacksmiths, Artisans, Sculptors, and Metallurgy. Every piece of art and fine metalwork appearing in Greek myths, were always attributed to him. This bracelet part of collection of stainless steel, gold, and rubber, represent a combination of accurate stainless steel work, elegant laser engraving, and the use of 18K gold to complement the fine detailing of this exceptional men’s or women’s bracelet. This is why this line is named after Hephaestus who was worshiped by all artisans and artists in Ancient Greece. This handmade high quality bracelet has a double stainless steel band, with a double rubber band in the middle. The closure and detail are made of stainless steel. 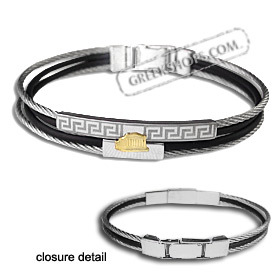 The traditional Greek Key design is etched onto the stainless steel in the center of the bracelet. The 18k emblem features the Parthenon. This bracelet can be worn by both men and women. Stainless Steel and 18k gold.